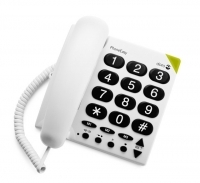 Doro 311c Big Button Telephone With Flash Alert. Enables people with a hearing impairment or impaired hand function to use the telephone more easily.The Doro 311c is a big button telephone, with large and clearly defined buttons. Incoming calls can be seen and heard with a flashing indicator light. 3 speed dials and 10 two touch memory buttons. Easily adjustable receiver volume control and it is hearing aid compatible.